See more Advocacy content in the Members Area such as National Energy & Climate Plans, Advocacy and Meeting reports. Formed in 2017, the Electrification Alliance brings together a variety of stakeholders calling for clean electricity to be recognised as the key energy carrier for an efficient and decarbonised European future. In doing so, the Alliance members are working towards enabling technologies to advance Europe’s competitiveness, economic growth, job creation, and the promotion of a sustainable society for European citizens. In this regard, the new Commission should demonstrate ambitious climate and industrial leadership during its next term in order to deliver on the ambition of the Long Term Strategy. This letter lays out a series of measures to achieve a deep decarbonisation of the EU economy based on renewables-based electrification. WindEurope and other trade associations and technology platforms on renewable energy have sent a letter to the Council of the European Union ahead of this week’s Working Party meetings on the Horizon Europe programme. The signatories call on the council representatives to support a more robust target of 35% for climate related research & innovation in the upcoming framework programme. Climate mainstreaming deserves clear and consistent governance. Innovation policy must supply new technology to bring down the investment cost of decarbonising the European energy system. WindEurope and other trade associations sent a letter to Members of the European Parliament ahead of the vote of the ENVI committee on a resolution regarding the EU 2050 climate strategy. The signatories call for acknowledging the key role of demand-side flexibility to enable the clean energy transition. In most scenarios proposed by the European Commission the shares of variable renewable energy sources is set to increase. Ensuring decentralised energy resources (demand response, storage, self-generation…) can interact with the electricity system through smart and digital solutions will provide the necessary flexibility to integrate renewables in a cost-efficient way while delivering consumers with significant costs savings. WindEurope and a wide range of signatories sent a letter to the Secretary of State for Exiting the EU, Dominic Raab and the European Chief Negotiator, Michel Barnier calling for energy and climate change to be included in the Brexit Political Declaration. The right Electricity Market Design is key to enable the achievement of a successful and cost-efficient energy transition. Grasping all the benefits provided by shorter and more dynamic electricity markets and building a future-proofed electricity grid infrastructure is needed to provide robust, smart, flexible and ready solutions to integrate more renewables and efficient distributed generation, while optimizing the overall efficiency of Europe’s electricity system. Decentralised demand response and energy storage at commercial and residential level, including electric vehicles, can greatly facilitate the integration of ever larger shares of variable renewables in the grid. As EU energy ministers gather in Linz on 17/18 September to discuss the reform of electricity market design, co-signatories of this declaration call on Member States to grasp the immediate opportunity provided by this reform to unlock their vast potentials. Specific recommendations include: simultaneous participation in all markets individually or through aggregators, inclusion in grid planning process and clearer ownership rules by regulated entities for storage assets. EU27 and UK businesses point to a sensible landing point for Brexit negotiations on energy and climate change. Specific recommendations include: UK/EU post Brexit cooperation on setting long-term GHG emission targets; For climate change and energy to be addressed together in a comprehensive Climate and Energy Chapter so that respective EU and UK climate and energy interests can be balanced; Agreement to prioritise delivering zero tariff and non-tariff barriers to trade between the EU27 and UK in low carbon goods and services; Agreement to no tariffs on energy trading, efficient trading arrangements across UK/EU interconnectors and cooperation in developing markets for shared electricity balancing services. Missing Trader Intra-Community Value Added Tax fraud remains a persistent threat to the integrity and well-functioning of electricity, gas and emission allowance markets in Europe1. Billions of euros had been defrauded from European Exchequers before the Council of the EU decided on the introduction of a derogation from the VAT Directive2 for electricity, gas and emission allowance transactions. The derogation enables Member States to apply the Domestic Reverse Charge Mechanism (DRCM) to these goods and services. Should the existing derogation not be proactively prolonged by the Council before the end of the year, it will automatically expire at midnight on 31 December 2018 as stipulated in the built-in sunset clause in Article 199a3 of the VAT Directive. Ahead of the final negotiation round on the Governance Regulation on 19 June, leading organisations call on European institutions to deliver a robust governance system for the Energy Union. The post-2020 governance regime should ensure long-term climate and energy strategies are in line with the Paris agreement, should provide adequate measures to deliver on EU targets and should support integrated planning for the energy transition. As leading European and UK companies and investors, we recognise that climate change poses one of the greatest long-term threats to our economies and societies. We strongly urge both the UK and EU27 to commit to continuing to work together to meet the commitments set out in the Paris Agreement, in any future relationship. To ensure this is achieved, we call on you, in the Brexit negotiations, to develop a comprehensive Climate and Energy Chapter, which covers both trade and non-trade issues. transport emissions are nearly 20% higher than in 1990, while European transport needs are expected to grow significantly until 2050. Without ambitious action, transport is set to be the biggest GHG emitter in Europe by 2030. 33% and is on track to complete carbon-neutrality well before 2050. The co-signatories of this letter represent a broad cross-section of European interests striving to support the EU’s efforts to meet its climate commitments under the Paris Agreement and the UN’s Sustainable Development Goals (SDGs). We highlight the opportunities coming from the smart and efficient electrification of European energy use as a means to achieving the EU’s climate commitments while improving its competitiveness, creating high quality jobs, and asserting global industrial leadership in the development and deployment of new technologies. Electrification is further driven by trends in the economy on fuel efficiency, digitalisation and automation, which in turn can make technology work for vulnerable sectors of society such as low income households, local actors and SMEs. It is also a driver for cost reductions and increasing shares of renewables. We would like to express the importance of aligning the upcoming Multiannual Financial Framework (MFF) post-2020 with these commitments and opportunities, which we believe requires the European Commission to revisit its approach to energy infrastructure spending. The signatories of this statement believe that Guarantees of Origin (GOs) are a reliable instrument to track and prove to consumers that a given share of electricity supplied to their home or business comes from renewable sources. The Clean Energy Package offers a unique opportunity to strengthen the GO system as more countries, consumers, and electricity suppliers begin to use it . As both European Parliament and Council have now agreed on their respective positions on the Renewable Energy Directive, this paper aims to draw the attention of policy makers to some key issues ahead of the trilogue negotiations. WindEurope and other associations from the power sector call on the European Parliament and the Council to phase out regulated prices as part of the ongoing reform of the Electricity Directive. Enabling consumers to base their decisions during scarcity periods on market price signals is essential to further develop demand response and drive a cost-effective integration of renewables into the power system. The persistence of regulated electricity tariffs is one the reason why consumers have not fully benefited from the downward trend that wind power produces on the wholesale market. The future electricity market design should seek for an increased link between wholesale prices and retail prices in order to guarantee such pass-through effect to consumers. WindEurope has joined efforts with other industry associations and NGOs from the energy, manufacturing, standardisation, construction and building sectors to raise the need for an effective smartness indicator for buildings. This indicator is introduced by the proposal for a revised Energy Performance of Buildings Directive. It aims at indicating a building’s ability to actively manage its internal, self-generation and/or storage for both heat and electricity. The European Commission is now working with a consortium of consultancies led by VITO on a joint study that should develop a common definition and methodology for this indicator. WindEurope and other associations call on the consortium to focus on active measures of flexibility in their study, and not the passive efficiency measures within a building which are already addressed by the Energy Performance Certificate. This would be the best way to ensure that the indicator becomes a meaningful tool for building owners and occupants in order to unlock the vast flexibility of Europe’s building stock, and eventually support the wider energy system to integrate larger shares of renewables. Europe needs to integrate ever-growing shares of renewable energy sources into the wholesale power market. This path is a no brainer for Europe and for the signatories of this statement. Today however, a number of hurdles are in the way of reaching this goal. This is in particular the case for cross-border capacity allocation. As wholesale markets are increasingly interconnected and coupled, further progress is fundamentally needed to reach the objective of a truly integrated Internal Energy Market. In particular, we call for on policy-makers to support a step-wise regional approach to system operation that optimise social welfare beyond national borders. The Clean Energy Package for all Europeans is an ambitious response to the climate challenges we are facing in Europe today. The ongoing decarbonisation, decentralisation and digitalisation of the energy sector offer ample of opportunities, as electricity becomes increasingly decarbonised and electrification of all sectors of the European economy progresses. The signatories of this statement call on the European Parliament and the Council of the European Union to support the development of a stable and predictable regulatory framework for renewable energies. 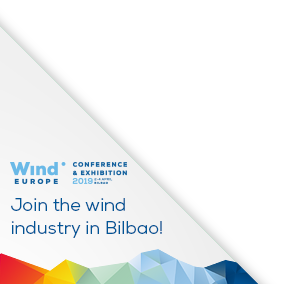 The wind industry today issued a letter to the European Council, setting out concerns regarding the ongoing Council deliberations on a new governance mechanism in the context of the Clean Energy Package. The European wind industry can make a substantial contribution to the energy transition. Onshore wind is now the cheapest form of new power generation capacity, and offshore is not far behind. Technology developments have also made it much easier and cheaper to integrate variable renewables in the energy system. Wind creates growth and jobs (now 300,000 across Europe) and reduces fossil fuel imports. And of course it also reduces CO2 emissions.